Crafts and Cravings: For the Men at Dream Valley! For the Men at Dream Valley! Today we have another challenge for you at Dream Valley! We would like to see your projects for the men in your life! We are sponsored by the awesome Jodie at Bugaboo Stamps! They have a great selection of digi stamps to choose from for one lucky winner! For my card I have used a Bugaboo image. Gus Golf in digi form can be found here at the Bugaboo store, or here in rubber at Totally Stampalicious! Great card Kendra. Love the simple clean lines. Isn't Gus great? I had a hard time choosing one of the many great images, and of course Gus was one of them that I turned to :) I love how simple this card is, letting your coloring and Gus stand right out. Great work! And Khristen is right, Gus is just the must awesome wee image for them blokey cards! 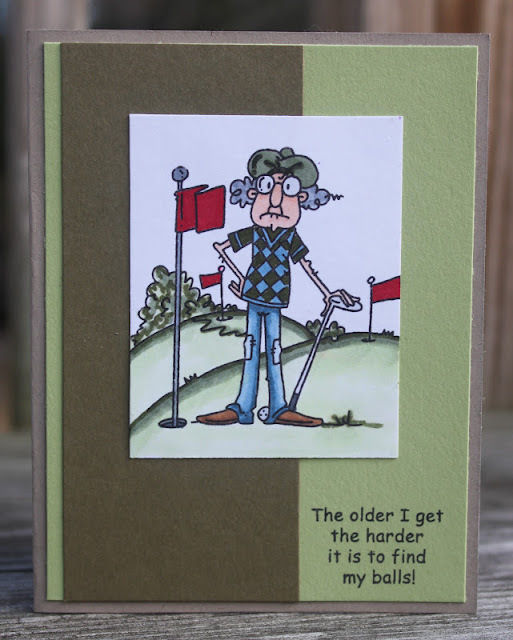 Love your wee card and colouring is perfect! Color Challenge at Totally Stampalicious! Totally Stampalicious New Release Blog Hop!!! !